Normally the power is transmitted from the battery to the electrics by means of a golf trolley battery cable. This is made up of two wires; one red (positive) and one black (negative). The two wires are wrapped in a insulated black plastic sheath. 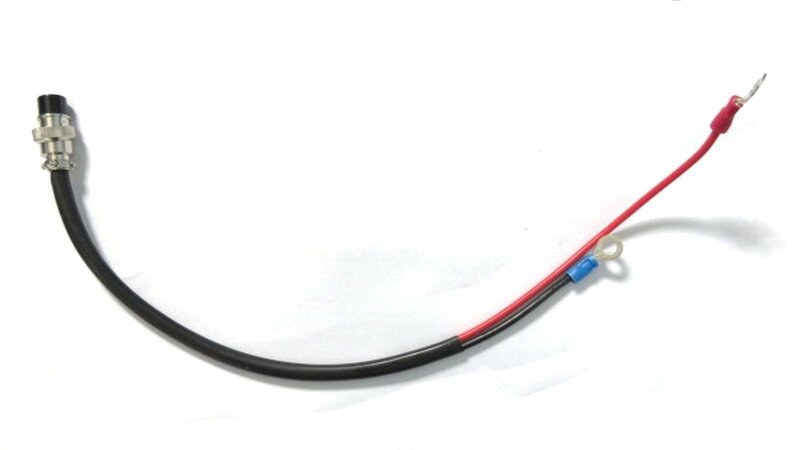 This battery cable sheath acts as a protector from the elements; weather, mud and damage. Some battery cables have fuses but these are not needed and only for protecting the battery from a misused charger. The golf trolley battery cable is one of the most common parts to go wrong. It is most likely over time and use to get damaged. Wear and tear can also cause the cable to malfunction. 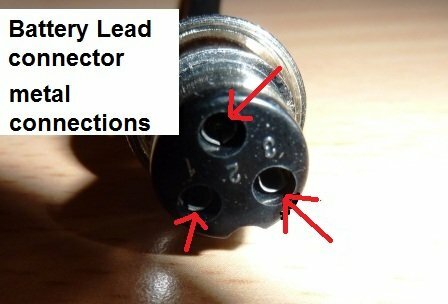 Most common fault is damage to the round 3 pin connector on the battery cable. 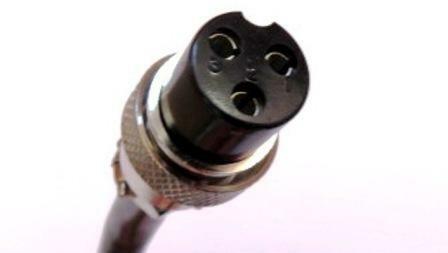 This 3 pin round connector is made of an insulated plastic with 3 pin holes. Inside the cable connector plastic end these 3 pin holes have inside metal sprung connectors. Damage can loosen the sprung metal connections inside the 3 pin holes battery cable connector. This can occur when the golf trolley battery cable is accidentally tucked while still in place. So this is something all golf trolley owners should be careful of not doing. Its an easy mistake, especially at the end of a golf round, 18 holes of golf is tiring, not to mention the concentration this takes. By the end of the round the mind is relaxed, tired and dismantling the golf trolley is almost on ‘auto pilot’ . Removing the battery while it is still plugged into the trolley. So when it comes to taking the battery off the trolley, it is easy to forget to unplug the golf trolley battery cable. This doesn’t always damage it straight away, but after a few tuck like this these metal connectors become loose if not broken and render the whole battery cable and lead useless. Other damage can occur by laying the battery onto the batter cable connector unintentionally the weight of the it especially a 36Ah size can easily crack the round black plastic of the connector. Video of golf trolley battery cable damage. The cable can get damaged when the internal wires are pulled in any way, the connector can be most likely gets damaged. Occasionally the battery cable may be able to transmit some current through the leads but as soon as a higher demand for current; i.e. more speed , then it can not deliver enough through to the trolley. This nearly always makes the golf trolley shut off the power completely. Testing a fitting a battery cable is not difficult to do. First of all testing can be done through the golf trolley. Does the golf trolley show full charge on the display unit, while making sure the battery is fully charged by other means; i.e. a tester put on the battery terminals should show over 13 volts. Shown the terminals of the battery and the attached battery cable wires. Red on the red positive terminal and Black on the black negative terminal. Both battery wires are held onto the terminals by way of a bolt, washer and nut. Making sure the washer is on the next the the nut and the round eye cable connectors are next to the metal of the battery terminal.